The Dolce Elite packs a whole lot of performance into a quality ride. Purpose-built to take you places—both physically and geographically—the Dolce Elite features a quality component package and a geometry that will keep you comfortable on long rides as you explore your boundaries. 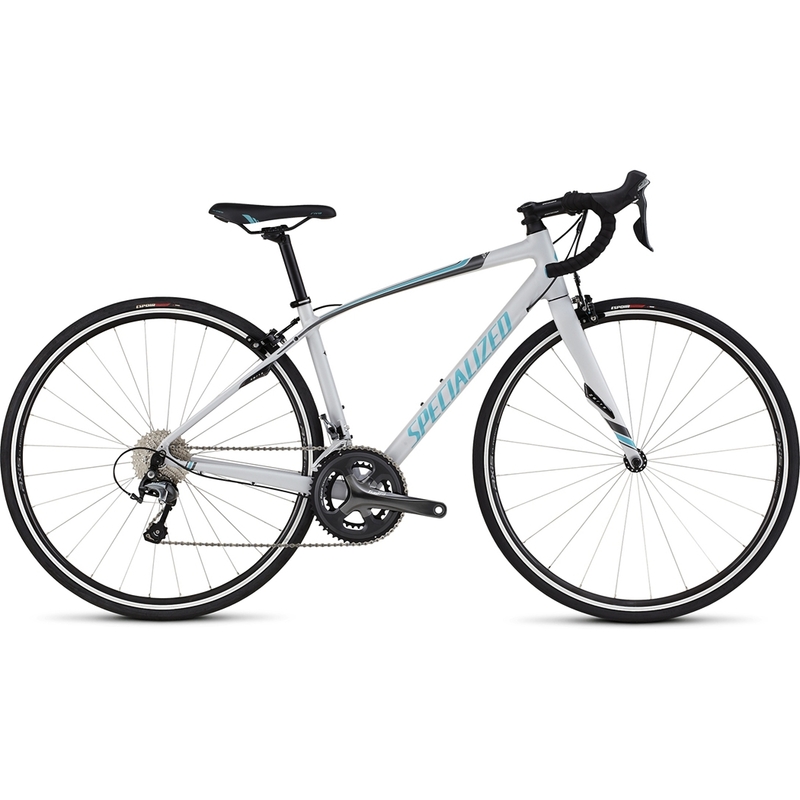 With its smooth-riding premium aluminum frame, this is the perfect bike to introduce you to the sport, or take you to new levels of confidence on your cycling journey. >D’Aluisio Smartweld technology in the E5 Premium Aluminum frame provides a lightweight and precise-handling ride, while the Women’s Endurance Geometry of the frame delivers improved stability for confident control when climbing and descending. This geo also puts you in a less aggressive and more natural ride position for hours of comfortable riding. >The agile and responsive FACT carbon, full-monocoque fork features Zertz inserts to absorb road roughness and give you a smoother ride. >The Dolce Elite features Shimano’s Tiagra drivetrain with compact 50/34 gearing. This affordable, quality group provides smooth and reliable shifting on climbs. Specialized E5 Premium Aluminum w/ D'Aluisio Smartweld Technology, Women's Endurance Geometry, women's fully-manipulated tube sets w/ smooth welds, Zertz, 1-1/8" lower bearing. Specialized FACT carbon, Zertz, full monocoque, for 1-1/8" bearings. 1-1/8", integrated sealed Cr-Mo cartridge bearings, 20mm alloy cone spacer, w/ 20mm spacers. Specialized 3D forged alloy, 4-bolt, 6-degree rise. Specialized Roubaix, w/ 2.5mm gel pads. Shimano Tiagra, 10-speed, long cage. KMC X10, 10-speed, w/ reusable MissingLink. Specialized Espoir Sport, 60TPI, wire bead, double BlackBelt protection, 700x25mm. Body Geometry Women's Riva Sport Plus, steel rails, 155mm. Specialized Sport, alloy, 2-bolt, 27.2mm. 44.0 48.0 51.0 54.0 57.0. 519mm 532mm 548mm 567mm 589mm. 269.5mm 269.5mm 269.5mm 269.5mm 271mm. 73mm 73mm 73mm 73mm 72mm. 69mm 63mm 60mm 60mm 60mm. 369mm 369mm 369mm 369mm 369mm. 574mm 580mm 580mm 590mm 614mm. 975mm 984mm 984mm 994mm 1020mm. 504mm 517mm 527mm 536mm 564mm. 679.5mm 699.8mm 720.8mm 750.6mm 778.5mm. 363mm 392mm 422mm 457mm 487mm. 360mm 380mm 400mm 400mm 400mm. 165mm 165mm 170mm 170mm 172.5mm.